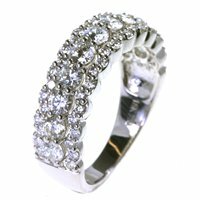 No matter what anniversary you have whether one month, one year, ten years or fifty years with your beloved ones, WeddingBands.com has something to offer for everyone. Add some extra brilliance to your special day with our anniversary diamond rings. At our online store, you'll find the right jewel to surprise the love of your life. 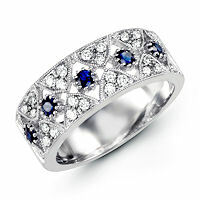 Sure, our selection of superb anniversary diamond rings is to impress everybody. Don't wait for a particular day / moment, just show your darling how much you love her. Compliment her with a luxury anniversary ring just because you can't imagine your life without her. Shop our fine selection of 14 karat gold diamond anniversary bands. Shop our collection of 18 karat gold women's diamond anniversary and eternity rings. 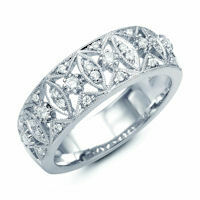 Desirable fine platinum diamond anniversary bands for you special day. 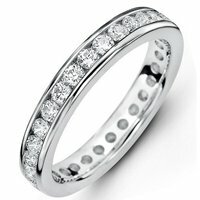 Great selection of palladium diamond anniversary bands and eternity bands. The jewelry is the most adorable and desirable women gift having dozens of designs. But still choosing a 10-year anniversary ring isn't a walk in the park, right? 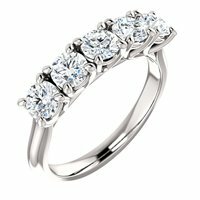 Keep calm, WeddingBands.com is a connoisseur of women's souls. We know that a gem has to reflect the inner world as well as to call back the memories of the awesome days. And we still need a drop of your help. Tell our jewelry expert both the finger size and an admired style of the jewelry whether Verona Lace Line, classical or modern. WeddingBands.com guarantees the highest quality of the goldsmithry. We use a peculiar CNC matching technology - and the diamonds are sparkling and twinkling thanks to the precise cut. No one will be left unfazed. Find a gem that perfectly describes your relationship. By the way, no occasion is required to adore your girlfriend with an anniversary band ring. WeddingBands.com has a unique service of manufacturing jewelry from your sketch, just send it to our mail CustomerService@WeddingBands.com or describe it to our jewelry specialist at (888) 422-4333.